« Let the Plant Shopping Begin! Sowing seeds is one of my favorite activities this time of year—especially since it’s still too cool and wet to plant much outside. Hardy perennials are easy. I sow the seeds as soon as I get them, mulch pots with gravel, and set them outside in a protected spot to germinate when they will. I get nice, tough, sturdy seedlings this way with a minimum of fuss. Plus, I’ve grown a wide variety of really fun plants this way, from hardy cyclamen (Cyclamen hederifolium) and ornamental onions (Allium spp.) to Devil’s walking stick (Aralia spinosa) this way. 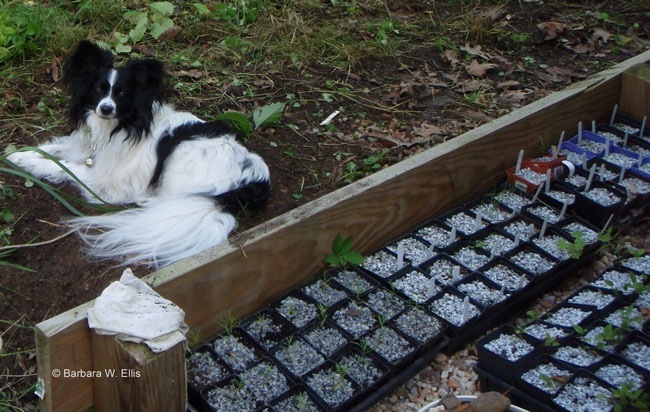 ABOVE: Bing supervising sown pots of hardy perennials. My thin semblance of organization falters when it comes to sowing tender plants, since more scheduling is involved. Since I’m planning a larger food garden this year to help provide the local food pantry with fresh veggies, I’ve already started pots of tomatoes and peppers. I’m planning to sow a couple kinds of basil later today. Here’s crux of my problem: I should have checked the frost dates weeks ago, so that I could make a schedule and sow everything on time. Gardening has never worked that way for me, though. So, after checking frost dates, the good news is I’m not hopelessly behind, although I could have started earlier. (No surprise there!) Tomatoes, peppers, and basil all prefer being planted out after the last frost, once the soil has warmed up. Yes, you can install all sorts of season-extension devices to get them in earlier, but for me, the path of least resistance is to wait for really warm weather to transplant tender crops. Sowing isn’t the only thing guided by local frost dates. Knowing when temperatures are likely to drop below freezing also helps determine when it’s safe to move transplants into the garden. I’ve always used NOAA’s Climate Normals chart to determine frost dates. (This link is for Maryland; go to this page to find data on other states. You can find listings for over 4,000 U.S. cities. )Unlike simplified sites, NOAA gives dates for three temperatures—28°, 32°, and 36°F—with three levels of probability for each temperature. That allows you to pick a date when there is a 90 percent chance temperatures will drop below a particular temperature, along with a 50 percent chance and a 10 percent chance. The date you choose depends on what crop you are sowing, and also on whether or not you are a gambler. For example, with cool-weather crops like lettuce, you may be willing to risk cooler temperatures and plant on the date when there is a 50 percent chance temperatures will drop below 32°F. If you are planting warm-weather peppers or tomatoes, though, it’s generally best to be safe, not sorry, and wait until you are sure the weather will stay warm. Note that the dates on the NOAA list are based on statistics through 2000, so warmer temperatures may come slightly earlier because of global warming. The site also gives dates for first fall frost and total estimated numbers for frost-free days in the growing season. This information is invaluable for scheduling plants that need a long growing season and also for planning crops that will be planted in succession. Use the information on the NOAA chart to adjust planting dates based on how much care you are willing to give your crops. For example, you can plant warm-season crops a little early and plan to protect them with cloches. Or sow cool-season crops extra early and cover them with row covers or plastic tunnels if necessary. 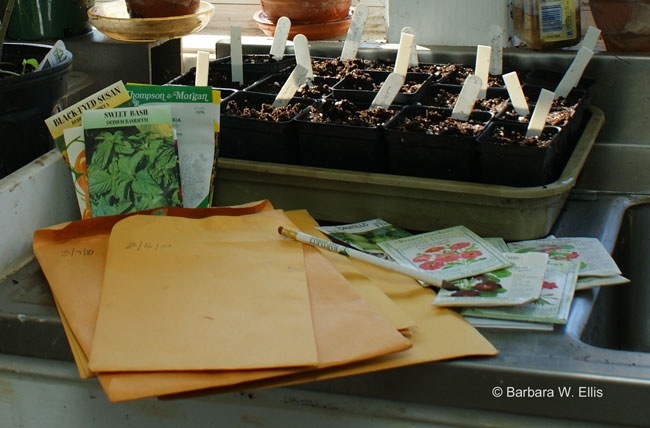 Turning a pile of seed packets into an organized seed sowing schedule is easy. You’ll need a few 8 × 10-inch envelopes (recycled are fine), plus a pen or pencil, and a calendar. You also may want to have a reference book or your computer at hand to search out germination specifics if you need them. ABOVE: Sorting seed packets to schedule sowing times. Ideally, I make separate envelopes for seeds that are going to be started indoors versus outdoors. You may also want separate envelopes for cool- and warm-season crops that have similar indoor sowing dates but different transplant schedules. I also like to have envelopes for seed that needs to be direct-sown in the garden. I’ll make a cool-season, direct-sown envelope for crops like lettuce and radishes, for example, and a separate envelope for warm-weather, direct-sown crops like nasturtiums. The goal is to gather together seeds that all need the same general treatment and schedule. This makes it easier to get them where they need to be when they need to be there. While this system won’t get your seeds sown, for me it does bring order out of what otherwise would be chaos. It’s the best way I’ve found to get seeds sown in time to give them the best chance at garden greatness. Happy to find this Blog, I am a eastern shore “hobby gardener”. Look forward to sharing pics of how my garden grows as well as seeing others. Greetings! It’s nice to hear from gardeners here on the Eastern Shore. If you’d like to share pictures of your garden, I’m happy to put them up in a post. Send pictures and text to let other readers know what’s going on to me at hackberrypoint@gmail.com. Great to hear from you! I’d cover your beds on the cold nights that are coming up. You may be okay. You can use old sheets. Floating row covers are great, too, and provide a couple of degrees of frost protection. Reemay is one brand. Floating row covers can lay right on top of the plants. Plastic works, too, but use wire hoops to keep it up off the leaves. I live in cambridge on marylands eastern shore ,and planted brocoli plants around april 1st and all my plants have crowns but I don’t know when exactly I can pick them to eat. Please anybody email me and educate me on this. Im a new gardener and would love some advice. Thanks and happy gardening. You can start picking any time. Cut broccoli when the heads are still tight and dense, if possible. When you are cutting, look closely at the plant. You should see more branches emerging at the lower leaf joints, below the heads that are ready to cut. If you cut just above these, you’ll get a second harvest from your plants.